Tuesday April 9th (Deir Yassin Day) at the St John's Wood Church NW8 (near the Central London Mosque). This central, prestigious and very beautiful church has long been a friend of Deir Yassin Remembered and has already hosted three commemorations in 2002, 2005 and 2007. If you would like to attend this event, do contact us. Mr. Eid was four years old at the time and lost his father and siblings in the massacre. 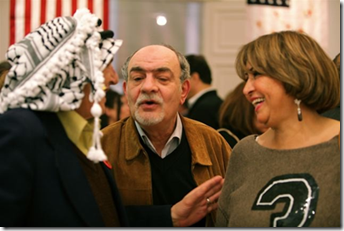 He will be in the UK for 2 weeks and will attend all Deir Yassin commemorations. 2013 is the 25th anniversary of the consecration of the first ever Deir Yassin memorial outside of Jerusalem. 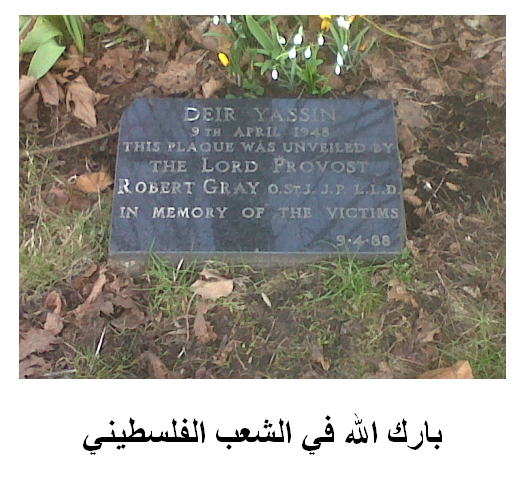 A commemoration, in the presence of Lord Provost of Glasgow, Councillor Sadie Docherty, will take place at the Deir Yassin memorial in Kelvingrove Park, Glasgow on Sunday, April 7th at 12 noon. To date, there are events at: Glasgow (April 7), Mere in Wiltshire (April 9),Wigan (April 11), Leicester (April 14), York Minster (April 16), and Brighton (April 17). If you would like more information, to mount your own commemoration and/or to obtain materials and advice, go to our Resources for commemorations page and do contact us. This page was last modified on: March 19, 2013.